Each bacterium breeds rapidly and can live for days afterwards providing ample time to infect the next unsuspecting person. WC Sanitiser dramatically reduces common cross infections from tummy bugs and viruses caused by using shared toilet facilities in the workplace. The under-rim of a toilet is non-glazed which means the surface is porous. This is an ideal place for bacteria to linger and breed. The sanitiser kills up to 99.3% of bacteria and germs in the first flush water, providing a safe environment for every user. The foam concentrate keeps toilets hygienic, odour-free and safe, working discreetly throughout the day. With every flush, the WC Sanitiser feeds a measured dose of active product which attacks hard water deposits and helps to prevent unsightly scale from forming – an essential system for all washroom facilities. 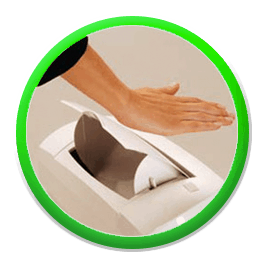 Safeseat /Toilet Seat Sanitiser are positioned in the cubicle beside the toilet tissue dispenser for individual use. 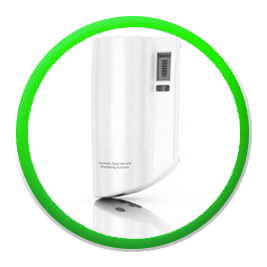 The user dispenses fragranced, quick-drying spray onto the tissue. By safely wiping away droplets, hair and bacteria left from skin contact, the risk of cross-infection from the previous user is quickly wiped away. Toilet Seat Sanitiser also means people are less likely to hover, a common cause of urinary tract disorders and paper mess as well as high usage of toilet tissue. A well cared for facility is proven to improve employee morale and can prevent downtime caused by sickness in the workplace. Countless types of potentially harmful bacteria are known to gather on door handles. AHS provides a Hygienic Door Handle and Auto Hygiene Spray to keep them clean and prevent human to human transmission of bugs and viruses. Hygienic Door Handle is used by many NHS trusts. The innovative steel hygienic door handle is activated on every exit, refreshing the handle with a fresh clean sleeve. 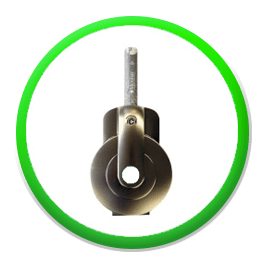 The lockable push and pull system is easy to use and suitable for any environment. Door Handle Auto Spray omits a fine mist, disinfecting the door handle. The quick-drying anti-microbial agent is effective against Pseudomonas aeruginosa, Norovirus H1N1 (Swine Flu), Influenza A2, E. Coli Staphylococcus aureus, Listeria monocytogenes, MRSA, Salmonella typhimurium. The product works continuously between sprays, inhibiting bacterial growth. Designer Tissue Dispensers are available in white, satin silver or chrome finish to suit all washroom styles. Lockable and sturdy, they protect your paper tissues from airborne bacteria. AHS Auto Sanitary unit is available for hygienic disposal of soiled dressings classed as offensive waste . The unit is operated by waving your hand across the sensor which opens and closes the modesty tray automatically, providing the most hygienic method of disposal. Your scheduled Service Technician will take the controlled waste away – there is nothing for your staff to do. 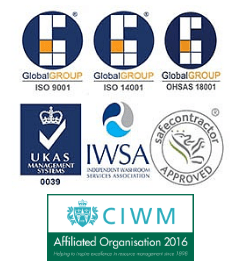 Waste transfer documents are completed so you can be assured that all compliance standards are met.